From 1904 to the beginning of 1906, Picasso's work centered on a single theme: the saltimbanque, or itinerant circus performer. Circus performers were regarded as social outsiders, poor but independent. As such, they provided a telling symbol for the alienation of avant-garde artists such as Picasso. Indeed, it has been suggested that the Family of Saltimbanques serves as an autobiographical statement, a covert group portrait of Picasso and his circle. Picasso reworked this painting several times, adding figures and altering the composition. The figures occupy a desolate landscape and although Picasso has knit them together in a carefully balanced composition, each figure is psychologically isolated from the others, and from the viewer. 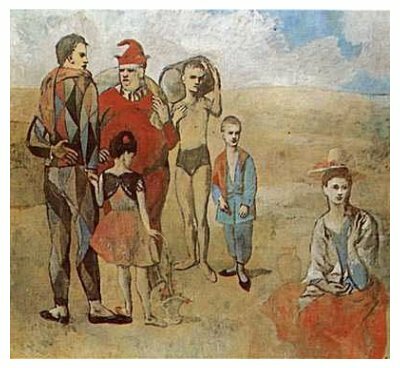 In his rose, or circus period, Picasso moved away from the extreme pathos of his earlier blue period, but in the Family of Saltimbanques, the masterpiece of the circus period, a mood of introspection and sad contemplation prevails.